Being one of the most important masters of the Jonang lineage, Jetsün Taranatha, at the same time, was of crucial importance for the Shangpa Kagyü tradition. 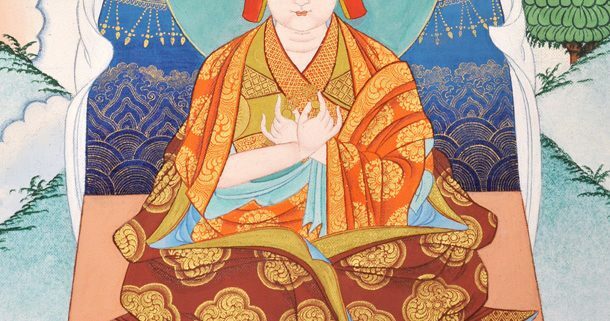 Taranatha was born in Drong, Tibet, supposedly on the birthday of Padmasambhava. His original name was Künga Nyingpo (kun dga’ snying po, sk. Anandagarbha). He reportedly used a Sanskrit name as an indication of the value he placed on his Sanskrit scholarship in an era when mastery of the language had become much less common in Tibet than it had once been. He was a successor to the rebirth lineage of Jetsün Künga Drölchok. 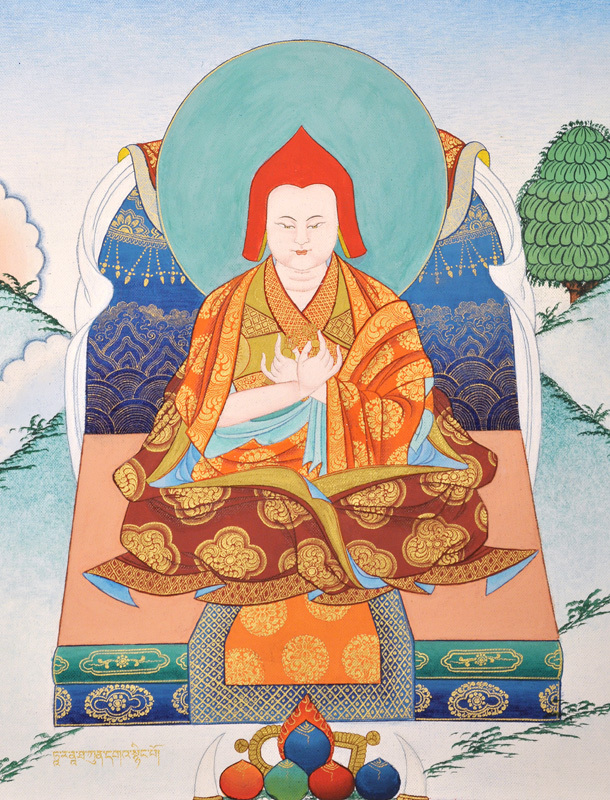 He received the entirety of major transmissions from the Kadam, Zhalu, Sakya, Shangpa, and Karma Kagyü traditions, and was an expert on the tantras from the later translation period (gsar bsgyur). He received the Dro lineage of the Kalachakra from his teacher Künga Palzang (a nephew and student of his predecessor Künga Drölchok) at Jomonang, and the transmissions according to Butön’s Zhalu Rwa tradtion from Kenchen Lüngrik Gyamtso. It was this master who recognized him as the rebirth of both Krishnacharya and Künga Drölchok. Most of the Shangpa transmissions he received from Chöku Lhawang Drakpa, and much of the Lamdré transmissions of the Sakyapa school came from Doring Önpo Künga Gyaltsen, all three also former students of Taranatha’s predecessor. Another important teacher of Taranatha was the Indian Mahasiddha, scholar and traveller Buddhaguptanatha, whom he met near Narthang in Tibet when he was only fourteen years young. From him he received a number of transmissions which had not previously appeared in the land of snows. Among them were the transmission of the tantras and instructions of Tārāyogīni, the Guhyasamaja according to the tradition of Jnanapada, the Dohas of Jalandhara, Varahi according to the tradition of Jalandhara, the Oral Instructions of Kusali and its Six Branches on the perfection process for Hevajra, and several heretofore unknown Mahamudra instructions, to name just a few. Taranatha composed a wonderful biography of this outstanding master, which is contained in his Collected Works. In the year 1615, Taranatha founded Takten Damcho Ling Monastery (Phüntsok Ling) south of the Richo Chenmo mountain hermitage and Great Stupa of Jonang, in the Tsangpo Valley about 200 miles west of Lhasa. After the take-over by the Geluk in 1642, it became known as Ganden Phüntsokling. Probably not long after 1614, Taranatha went to Mongolia, where he reportedly founded several monasteries. His rebirth became known as Zanabazar, the First Bogd Gegeen, or Jetsün Dampa (Jebtsundamba Khutuktu) of Mongolia. Taranatha was a prolific writer and a renowned scholar. His 23 volumes of collected works encompass topics on history, tantric ritual practice, zhentong thought, autobiography, pilgrimage, astrology, medicine, meditation, etc. One of his most well-known historical works is his famous “History of Buddhism in India” (dpal dus kyi ’khor lo’i chos bskor gyi byung khungs nyer mkho) of 1608, a delightful mixture of anecdotes about the lives of many Indian Mahasiddhas, as well as historical and geographical information. Available in English translation, it is one of the major sources for the study of Indian Buddhism for students from all over the world even today. His other major work, The Golden Rosary, Origins of the Tantra of the Bodhisattva Tara has also been translated into English. Other important historical works of his are his histories of the Kalachakra and Yamantaka tantras, and The Seven Instructions Lineages.